Jamie Wilson continued his run of good form by reaching the final of the first leg of the EASB Regional Junior Tour South. 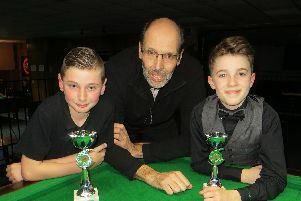 The 14-year-old lost 2-1 on home tables at Waterlooville Sports Bar to Connor Benzey, who chalked up a 108 break in the first frame of the clash. A crucial in-off on the brown in the decider when a clearance looked routine from Wilson gifted his 16-year-old opponent the frame and match. Wilson, also defeated 2-1 by Benzey in the group stages, was the only player to take frames off the Eastleigh-born talent throughout the tournament. Meanwhile, Samuel Laxton made a remarkable debut on the feeder circuit for the national under-21 tour. The 13-year-old won two of his three matches, including a shock 2-1 victory over Olly Gibbs – the 2017 England under-14 champion. But Laxton missed out on a place in the knockout stages on frames difference. Women’s world number 23 Chloe White made a group-stage exit. Callum Olivares, seven, was one frame away from winning the second group. He is now second in division two behind Jayden Hickley. The Monday Junior Snooker League still looks the same, though. Division one leader Zak Truscott, Owen Jenkins and Wilson – conceding a 40-point handicap start to all of his opponents – each won three of their four matches. Laxton continued his march up the league by winning the second group. Eight breaks of 20 or more were recorded in the 12th week of the Wednesday Junior Snooker League. Laxton knocked in a brace of them in his three straight victories which took him four points clear of Truscott at the top of division one. Week eight group winners: Owen Jenkins, Samuel Laxton, Arron Smith. Breaks: Arron Smith: 30; Owen Jenkins: 26; Samuel Laxton: 23, 20; Josh Richards: 13; Harvey Dunsmore: 9. Week 12 group winners: Samuel Laxton, Dean Russell, Tyler Mack, George Laxton. Breaks: Jamie Wilson: 38, 36; Owen Jenkins: 22, 22; Samuel Laxton: 22, 21; Dean Russell: 21, 20; Aaron Wilson: 12.